Eventually, something is going to break. That's the fate every garage door system inevitably has to succumb to. When that doom befalls it, though, all is not necessarily lost. Our company has been local homeowners with their overhead and roll up door problems for a very long time, and there's no issue we can't find a suitable solution for. 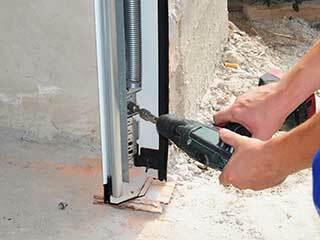 The best thing about a garage door opener is how convenient it can make your daily routine. The worst part about it is that when some part of it breaks or starts acting up, it becomes the very opposite of convenient. Luckily for you, our experts can take care of anything from a broken motor gear to fried circuit board. Count on us to repair or replace the damaged component and restore your opener's operation as quickly as possible. The springs – which are in charge of supporting the weight of your door panels – are under a lot of tension and will break eventually. This type of scenario can be extremely dangerous, as your door could end up collapsing. Replacing these components should only be done by professional technicians, in order to avoid the potential risks that mishandling them can lead to. Our technicians can replace your springs without jeopardizing anyone's safety. Your garage door track and rollers can suffer from a few issues as well. The track can become bent and cause the door to get stuck, while the rollers can end up breaking or rusting. Either of these scenarios can be expertly dealt with by our professional technicians. We'll make sure your track is straightened out and your damaged rollers replaced with better ones. When you find yourself facing a garage door problem, do the smart thing and give our experts at Garage Door Repair Huntington Station a call. There are too many risks involved in trying to repair these complex systems by yourself for it to be worth the hassle. Contact our team today and get things done quickly and safely.